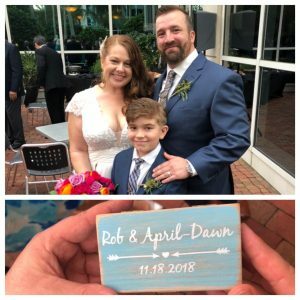 Robert and April Dawn decided on a lakeside wedding near Lake Eola in downtown Orlando, Florida. 310 Lakeside was the locations for the couple’s beautiful intimate ceremony. With close family and friends by their side the couple exchanged vows and rings in a touching Christian ceremony. In Bloom Florist did a beautiful job of crafting the couple’s colorful bouquets and boutonnieres. They also worked with April Dawn to design and create an amazing arch made of River Birch. Weddings Only DJ Service provided the sound system and microphones for the ceremony and kept the guest dancing the night away on the dance floor. Chip with Party Down Amusements provided the totally cool photobooth for the reception. With a built-in iPad the photobooth allowed guests to take pictures and post them to social media, send them to their phones via text message, or print them out on the spot. Edmund Rhodes with Rhodes Studios Photography and Videography captured every moment of the wedding day. From bridal party and family portraits in front of the couple’s bed and breakfast to the ceremony and on to the reception.